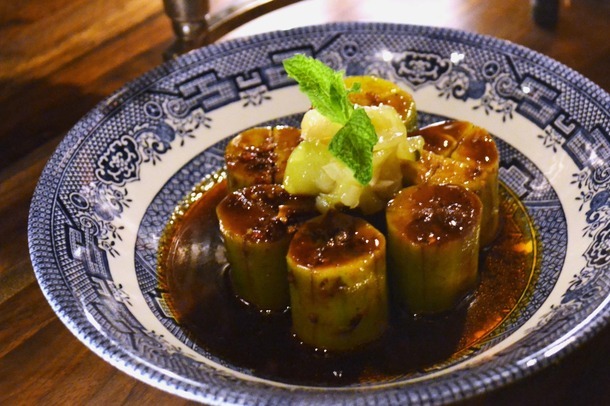 From a den of dark shadows and dripping candles comes exacting cocktails, turntable spins, and the spicy surprise of Burmese noodles, courtesy of budding bar star Kyle Webster and his James Beard-winning wife, chef Naomi Pomeroy. Order whatever you like, but the eight nightly specials are the show, each formulated to the drop and accompanied by a historic footnote. 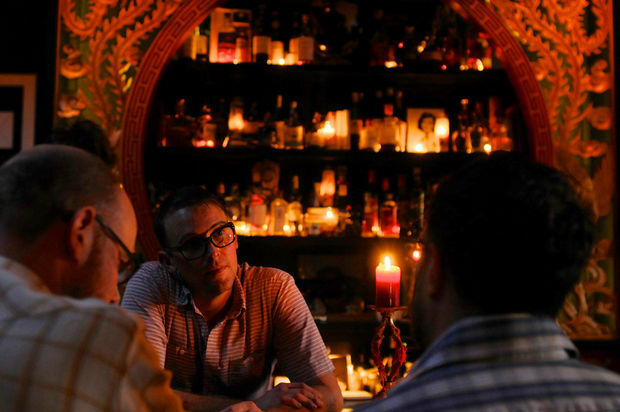 10 best foodie spots in Portland, Ore.
At first glance, this 30-seat place looks like one more dark, candlelit bar with two turntables and thrift-store decoration. 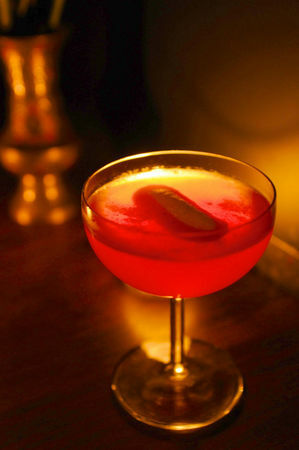 But Expatriate goes well beyond its six nightly cocktails, as creative and expertly mixed as they are. 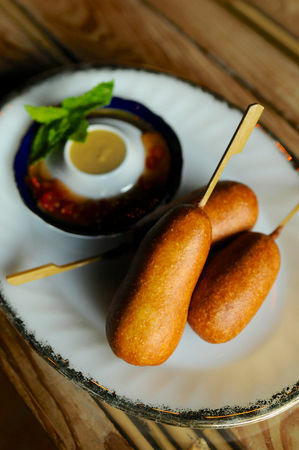 Local celeb chef Naomi Pomeroy has created a fantastic menu of spicy Asian-inspired bites like shrimp toast, crab rangoon, and a Chinese sausage "corn dog" that will dispel all memories of County Fair abominations forever. 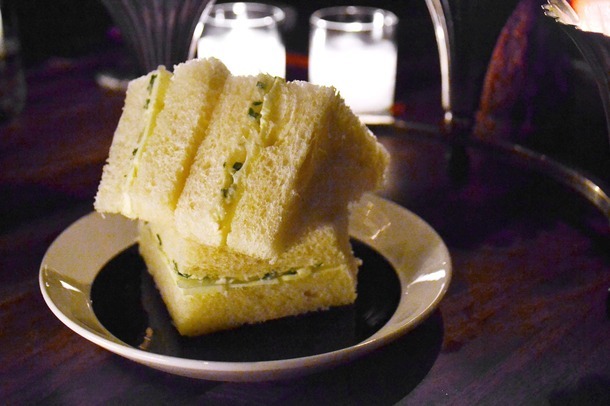 The stacks provide a nice welcome to Expatriate, the bar Beast chef Naomi Pomeroy and her husband, shaker-mover Kyle Linden Webster, opened across the street from that prix-fixe dinner house last summer. It’s a self-consciously worldly affair, the sort of place you expect people to swap stories about traveling by camel as they munch on Burmese tea leafs. True, you could drop $100 on drinks and snacks. But the cocktails are some of the finest in town. The six I’ve sipped were all stiff and balanced, especially the No. 8, a tonic of Pierre Ferrand 1840, Dickel rye, génépi, Italian vermouth and Regan’s orange bitters. Also enjoyable is a cocktail called the Dorleac, which is quite a bit sweeter, though not out of balance, with vodka, Aperol, lemon, honey, elderflower and Angostura bitters. In an era when so many Portland bars endeavor to make their own bitters with mixed success, Webster says he remains a defender of the classics, and makes his case well. The food menu is diverse and playful, with everything from corn dogs (crumbled Chinese sausage encased in supple breading) to a Burmese coconut noodle bowl built from wheat noodles, coconut sauce, cilantro roast chicken, duck confit and a gooey half-egg. 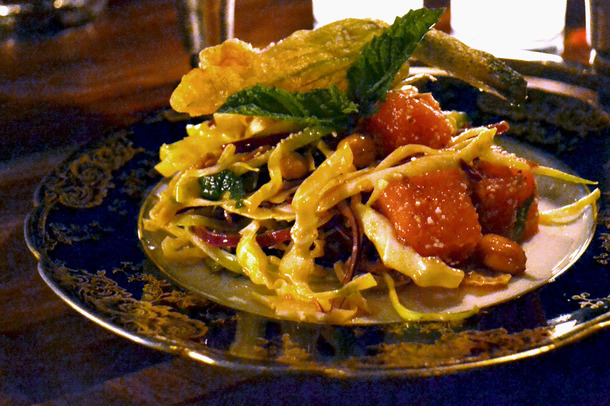 Best of all is a Brussels sprouts plate that finds Napa cabbage, Szechuan pepper vinaigrette, and caramelized squash with a little smoky ground lamb. 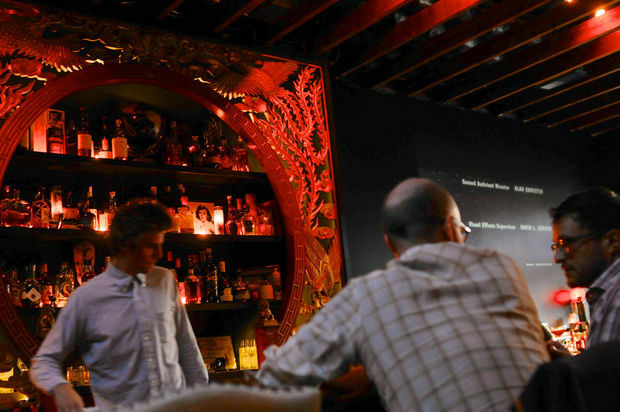 Among the city’s new wave of reservation-recommended watering holes, Pepe Le Moko and Multnomah Whiskey Library might be fun for an hour, but Expatriate left a lingering impression. Walk through the green canvas tent that separates this little world from the big world around it, and you feel privileged to live such a smart and fashionable life. 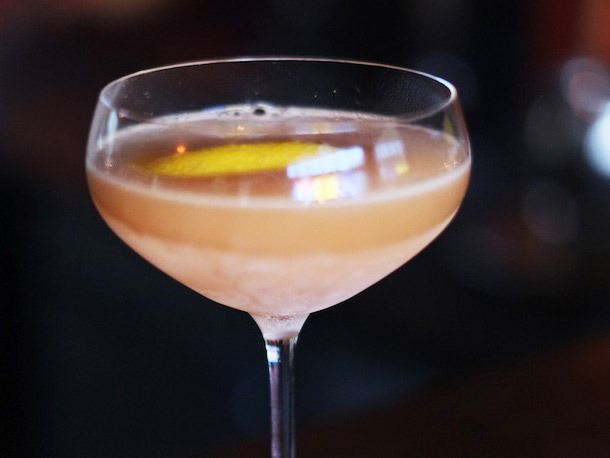 For a conclusive sample of the cool, creative, and sometimes confusing Portland food & beverage culture in one glass, stop in at Expatriate, a bar built around the personality of Kyle Linden Webster and his James Beard-nominated wife and nearby Beast owner, Naomi Pomeroy. Anything you drink here will be balanced, boozy, and damned cool, but try the Precariat and see if it reminds you of the crisp mountain air Webster had in mind when he created it. My days, like anyone's, are mundane hashes of sock hunting, empty toothpaste tubes, automated phone systems, and noticing weird new lumps on the dog. When I walk into Expatriate (5424 NE 30th) it's as though I assume the identity of the urbane, civilized person I was meant to be. It's said that the clothes make the man, but it can also be said that the room makes the evening. Expatriate is a room to disappear into, adjacent to the current universe, where adults are treated like intelligent things, where they can feel good looking and witty, and let their evening unfold in an intimate space whose attendant pleasures are the most refined of their kind. 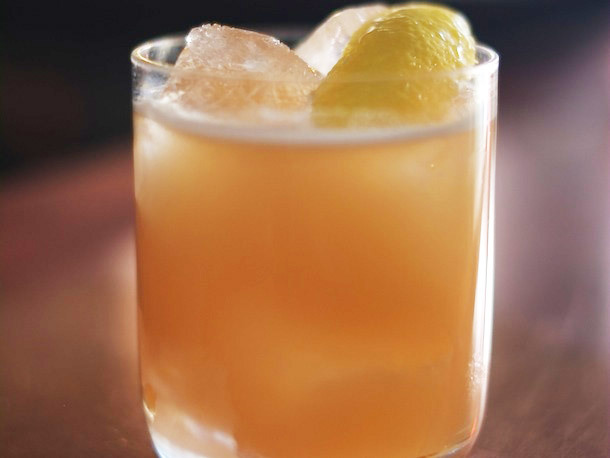 Kyle Linden Webster's house cocktails are as meticulously crafted as they come, but he's also talented at inventing drinks on the fly. ("Name a color, I'll come up with a drink," he said. "Copper," she said. He came back with something involving tequila, sherry, apricot brandy, citrus... there was more to it, but in a word, it was sublime.) And getting to enjoy Naomi Pomeroy's world-class cooking alongside—without the commitment of a reservation at Beast—is, to me, one of the best developments of 2013. 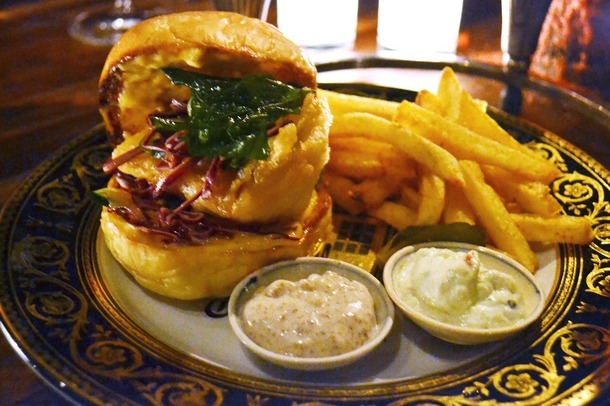 Have you been to Expatriate yet? If not, what in the world have you been waiting for? Expatriate is located in Northeast Portland, 5424 NE 30th Avenue, across the street from Cocotte, Beast, and Yakuza. (Beast diva Naomi Pomeroy is Webster’s significant other and had sizable input into some of the touches at Expatriate.) There’s no sign on the handsome period building, and little of note outside to indicate what’s inside. But it’s well worth going in. 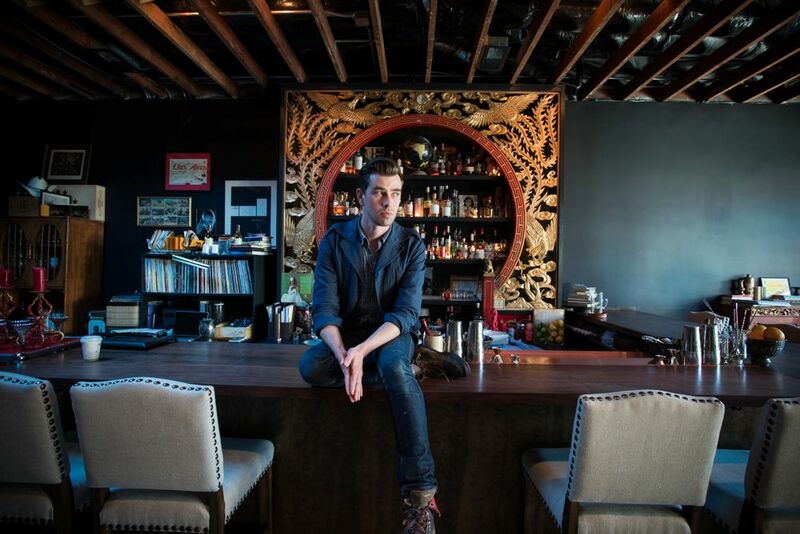 Kyle Linden Webster, one of the most consistently creative bartenders in Portland, finished his reign at the outstanding St. Jack’s bar and opened his own place. It’s very much a reflection of his philosophy and style: cool, cerebral and seemingly detached on the surface but roiling with dynamic tension underneath. Webster is quiet, reserved, laconic---until you touch on a topic near and dear to his heart, like music (he’s a DJ, and has two turntables at the bar with an eclectic selection of vinyl that will instantly change the tone and tenor of the room); or literature (he’s a voracious and quite sophisticated reader); or his travels in some of the more exotic countries of Asia; or his fiercely held views on the necessity of precise balance in any cocktail he makes. Webster’s Expatriate Bar is a reflection of all that. 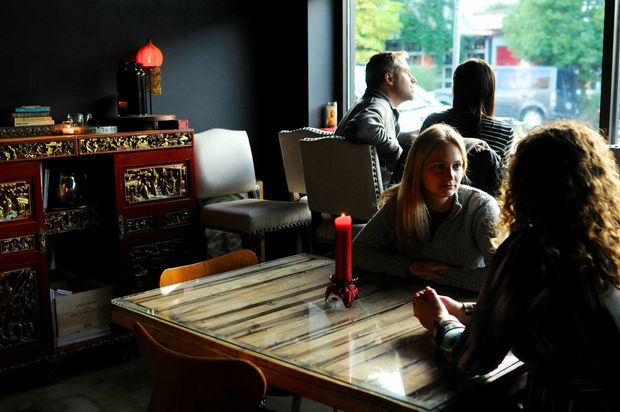 If all you require is a clean, quiet, fashionably dim place to sip your beverage and chat with friends, Expatriate will be that place for you. If you aspire to more, and want to pleasantly engage your mind on music, travel, art, exotic cuisine or even philosophy, Expatriate will be that place as well. 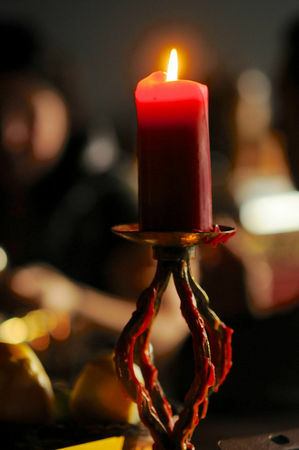 From the precisely selected color of the midnight blue walls, to the almost cloistered isolation of the curly maple wood booths along the side of the room, to the welcome and inviting polished mahogany bar with the colorful Chinese salvage piece in a brilliant array of lacquered red and gold, Expatriate is an intriguing appeal to all the senses. Don’t be surprised if you think you see an older man in a rumpled linen suit, pale and somehow British, huddled in a back booth talking to a quiet American in hushed but despairing tone. Or a boisterous, brawny, bearded man at the corner of the bar disclaiming with definitive arrogance about bullfighting or gin. It’s that kind of place, where you might see ghosts of expatriates from different times and different worlds. 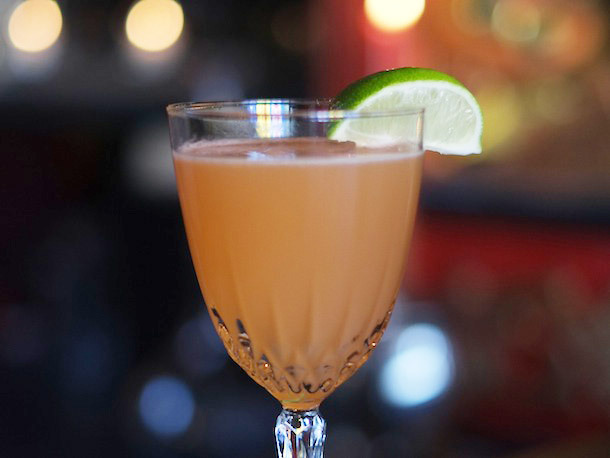 What you will definitely see is a list of incredibly inviting and devilishly delicious cocktails, from tweaked revivals of classic pre-Prohibition potables to modern invocations of exotic flavors to startling combinations of ingredients that you’ve never thought of but will likely not forget. The Shanghai is composed of Appleton V/X Jamaican Rum (the V/X signifies the rum is blended from 5 to 10 year old casks), Pierre Ferrand Dry Curaçao (one of the most astonishing “new-old” spirits to debut in recent years, a dry and spicy version of the usually overly sweet and bland triple secs in the market), fresh limes, real Grenadine (fresh pomegranate syrup), and Kübler Swiss Absinthe. Trust me: it’s exquisite. You really do have to try it for yourself. Consider as well the fascinating Mood Indigo (gin, cognac, violet liqueur, Aveze Gentiane liqueur, Cocchi Americano, and del Maguey Mezcal! 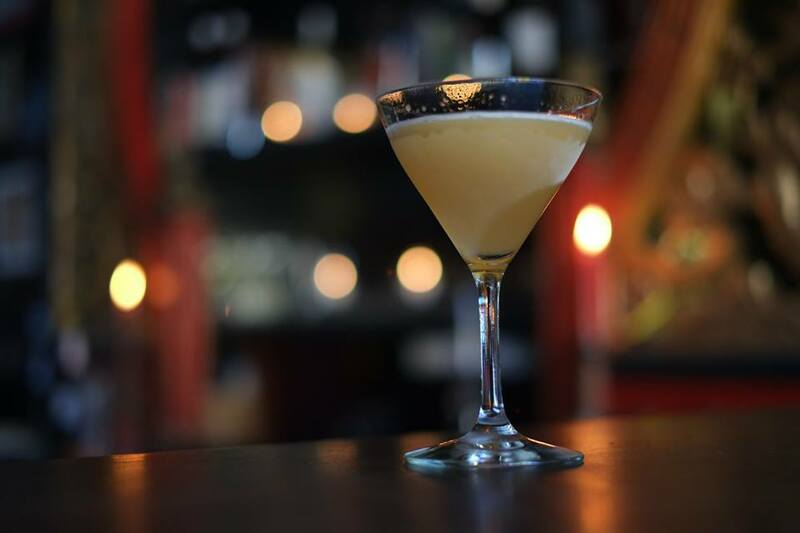 Or Habitué (Irish whiskey, Sardinian Myrtle liqueur, Mandarine Napoleon Curaçao and Noilly Prat Dry French vermouth.) 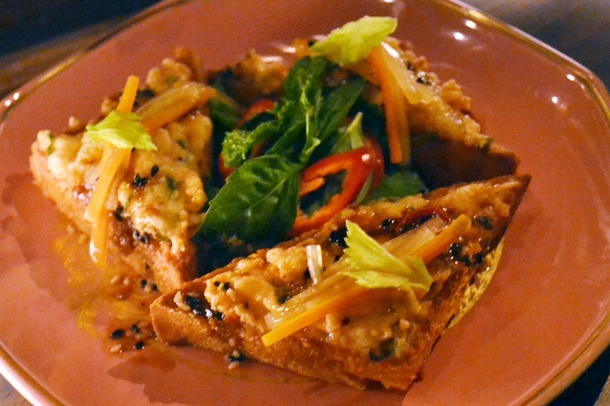 Finally, consider a crowd-pleasing Expatriate favorite, the No. 8, an intoxicating (in all senses of that word) blend of Pierre Ferrand Original 1840 Cognac, rye whiskey, Dolin Génépy des Alpes, a bittersweet elixir from the French Alpine slopes, Cocchi sweet vermouth from Italy, and Regan’s No. 6 Orange Bitters. 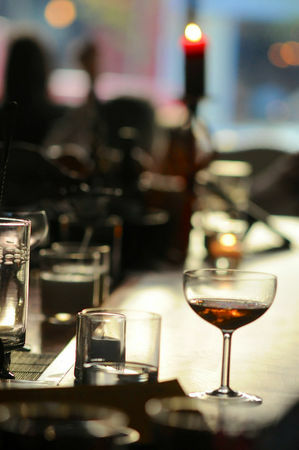 Fact is, there’s not a single entry on the cocktail list that fails to intrigue the adventurous drinker. Which, of course, requires multiple visits to Expatriate to complete the challenge. There is also a short but exceptionally well selected list of sake, wine and beer available. A word about the food: no standard blah bar snacks here. You will not be bored. 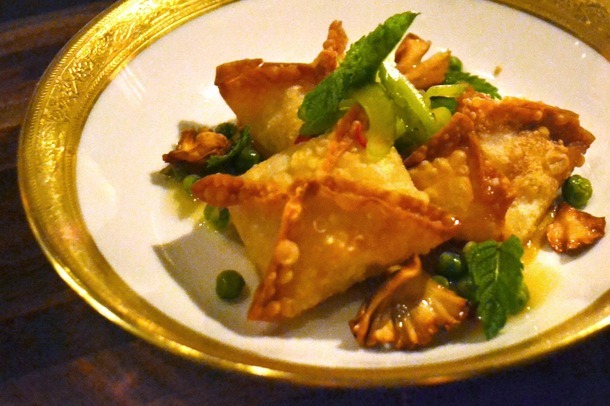 The Expatriate kitchen puts out a startling array of Drinking Snacks of mostly pan-Asian delights, from Dungeness Crab Rangoon to a Burmese fermented tea leaf and papaya salad, to Brussels sprouts that will force you to forever change your mind about Brussels sprouts. Perhaps the best summation of what Expatriate is comes from their website: It’s in that spirit, in the balance between the implicit and explicit, that Expatriate works as a whole, as a place for drinking and eating other than the sum of its parts. 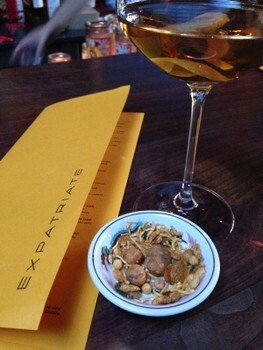 So, to repeat: Have you been to Expatriate yet? If not, what in the world have you been waiting for? At her highly regarded Portland restaurant Beast, chef Naomi Pomeroy is known for a sophisticated French-accented prix fixe menu that changes by the week. But when Pomeroy and her cocktail maestro husband, Kyle Linden Webster, took over the bar space across the street from Beast, they looked beyond Europe for menu inspiration, traveling to Southeast Asia this winter to research the colorful flavors of Thailand and Burma (Pomeroy has also clocked considerable mileage in India). So while the appropriately-named Expatriate focuses primarily on cocktails (check them out here), there's also a full menu of South Asian-inflected "drinking snacks" to pair with the beverages. The flavors are not for the timid—this is tongue-busting fare; spicy, salty, sweet, and sour, sometimes all at once—but even deep-fried dishes (of which there are several) are shot through with a fresh crunch of raw herbs or pickled vegetables. It takes a skilled hand to keep all of those loud flavors in check, and while the food at Expatriate is bold, it's still balanced. Nothing here is presented as particularly traditional, and it's not meant to be. These are just well-crafted, highly craveable bar bites that pair well with the long, late nights that Expatriate is preternaturally conducive to. An impartial review of the food is tricky for me since I'm friendly with the couple, so instead I took it upon myself to order every single thing on the menu (hey, it's called research) and ask the chef to walk me through the creation of each dish. Check it all out in the slideshow. About the author: Jamie Feldmar is a noodle aficionado, barbecue lover, and the managing editor of Serious Eats. You can follow her on Twitter at @jfeldmar. Portland, Oregon's Expatriate was founded over a conversation aboutThe Hero with a Thousand Faces by Joseph Campbell. Kyle Webster was working a guest shift at Kask when he struck up a conversation with a friend across the bar about the social fabric of the world and the history of the way people interact. "I've found a shrinkage of the public space and a rise of solipsism and loneliness," says Webster. "I wanted to create a space that encourages interaction outside of the digital life we've grown accustomed to." Webster points out how the layout of Expatriate was planned with that goal in mind: "The backrest in each of the booths is purposefully set low to create one contiguous space so that guests can easily converse with their neighbors," says Webster. The rest of the bar faces a carved golden arch of birds mid-flight framing a collection of spirits, classic cocktail books, and some of Webster's favorite works of fiction. We asked Webster how he goes about developing cocktails. "I try not to over-think the recipe," he answered. "I try to relax and hone in on the flavor I'm seeking, and always involve the kitchen in sampling to provide feedback." The kitchen is headed up by Webster's wife, chef Naomi Pomeroy of Beast. About the Author: Greg Harned lives in Portland, OR, where he enjoys cocktails, drinking, and general mischief-making in candlelit speakeasies, swanky cocktail lounges and dingy dive bars. He manages Portland Craft Cocktails where he writes about his various exploits. You can follow him on Twitter @craftcocktails.